WAPO reported Trump spent the weekend at Mar-a-Lago stewing, watching cable news and calling friends to vent. On Saturday and Sunday Trump skipped golf, reportedly to honor the Parkland victims. On Wednesday, WAPO reported two senior US Geological Survey officials resigned after Zinke asked them to provide confidential data on the National Petroleum Reserve-Alaska before it was released to the public, an action which would violated the USGS’s scientific integrity policy. On Wednesday, Rep. Gowdy, chair the House Oversight Committee, demanded Pruitt turn over documents related to his first-class travel, and raised concerns about conflicting statements from Pruitt’s press office. CNBC reported Trump’s former bodyguard, Keith Schiller, worked for Trump for nearly 20 years, is being paid $15,000 a month from a GOP slush fund. Schiller has been questioned as part of the Mueller probe. Van der Zwaan was hired by Manafort and Gates to prepare the report while working for Skadden. Last year, Skadden fired van der Zwaan and has been cooperating in the Mueller probe. On Thursday, amid customer feedback and complaints, the First National Bank of Omaha ended its relationship with the NRA. Car rental companies Enterprise, National, and Alamo also cut ties. Kelly’s memo in Week 66 could mean Kushner and Ivanka could lose their high-level security clearance as early as Friday, February 23. On Friday, Trump told the press he would leave the decision to Kelly. 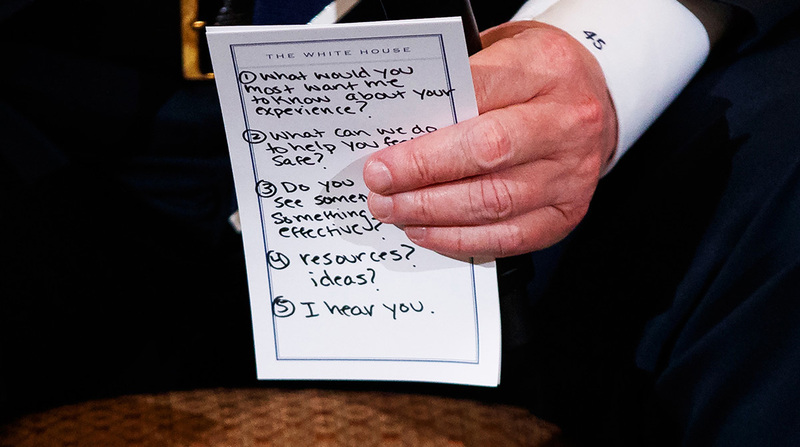 Trump holds notes during a listening session with high school students and teachers in the State Dining Room of the White House in Washington, Wednesday, Feb. 21, 2018. Trump heard the stories of students and parents affected by school shootings, following last week’s deadly shooting in Florida.